Suzuki Violin and Piano Lessons in my home. 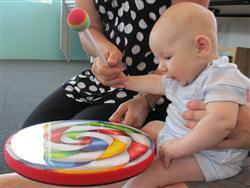 This amazing class starts you and your child on a rich and exciting musical journey. We combine music and movement to develop a supportive, positive environment to acquire a lasting enjoyment of music, self-esteem, determination, communication and confidence. From dancing with your little one to playing beautiful orff instruments like the glockenspiel and xylophone, this class sets a foundation for tone, pulse, pitch, and rhythm. Based on the Suzuki Mother-Tongue-Approach (learning by ear), we work with parents through joyful repetition of lullabies, action songs, stories and nursery rhymes. We even enjoy a visit from the violin, cello, mandolin and guitar. We create an environment free from pressure where babies and toddlers can develop rhythmic and melodic awareness, memory and social skills, increased vocabulary, and sensitive group participation at a young age. Want to try out this class before making the 9-week commitment? Send me a message, and we'll let you know when we have space for a drop-in. There is a $10 fee per drop-in, and just one drop-in per student is allowed. Q: What is the difference between Suzuki ECE and something like Kindermusik or Music Together? Suzuki ECE program is not franchised. Suzuki ECE classes recognize the importance of parent education and devote much time developing a partnership with parents to help them create a natural enriched learning environment in the home. Suzuki teachers are trained to foster ability while most traditional teachers use the "teach and move on" approach following a calendar driven curriculum. Suzuki ECE teachers understand the potential for assisting parents in creating rich musical environment before baby is born and are convinced that the spirit of the child is formed as a result of their environment. The Suzuki Mommy and Me class uses a constant curriculum over a 3 year period to ensure thorough mastery.